CCC’s new Smart Estimate tool will initially be offered to insurers when it goes on sale early next year, but an executive said Monday the company was also having conversations about the product with collision repairers. “I think Smart Estimate will be used by shops,” CCC product management Senior Vice President Jason Verlen said Monday. Insurers are testing Smart Estimate ahead of the program formally hitting the market sometime between January and March 2019. The software’s artificial intelligence has been trained on CCC’s library of estimates with photos to recognize damaged parts. 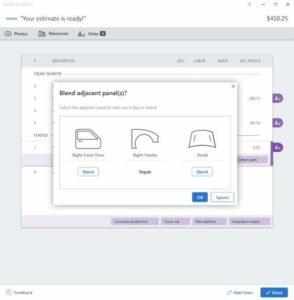 Combined with estimating logic guidance, the software is able to prepopulate an estimate with the damaged parts before handing it over to a human to finish the sheet. The system also can predict what other parts internally might have been damaged, and CCC plans to add the capability for Smart Estimate to make repair or replace predictions as well. Its outputs are clearly not going to be substitutes for estimates and repair plans developed by a body shop after a complete teardown, in consultation with OEM repair procedures. However, it seems as though Smart Estimate and other elements of CCC’s Smart Claims suite could still have applications in a shop. Collision repairers can use their own photo estimating and scheduling apps to “capture a sale,” according to Big Sky Collision owner Matthew McDonnell, who began offering the technology to customers earlier this year to great success. Matthew McDonnell, a Society of Collision Repair Specialists board member, said earlier this year he is drawing as much as $60,000-$70,000 in monthly sales from his shop-branded Body Shop Booster app alone. Big Sky Collision writes what it can see, and it includes a line item declaring that a supplement will be possible, for the estimate was written off of photos alone, according to McDonnell. Customers who use the app don’t have sticker shock once Big Sky performs the teardown and writes the real estimate, he said. The CCC app could play a role in such a use case by making the initial estimate quicker for the shop. Smart Estimate also suggests potential operations to add manually, a feature Verlen said is being used consistently by the insurers testing it now. While ultimately the OEM procedures and vehicle circumstances will dictate the shop’s repair, this feature could still be a helpful resource to a collision repairer attempting to train an estimator or as a method for a veteran writer to hedge against forgetting to add a step. CCC Quick Estimate includes a mobile app to quickly submit claim information. This is essentially a variant on McDonnell’s software. CCC Smart Audit uses “photo analytics and AI to flag line-level items which appear out-of-norm vs. industry averages,” according to CCC. Given the industry’s demonstrated lack of training and repair procedure usage, the industry average is a questionable benchmark with the potential to unfairly pressure quality shops to the bottom. However, the concept seems as though it could be modified to drive struggling shops to the top as well. CCC Smart Total Loss can with a single photo determine if a car is a total loss with more than 90 percent accuracy, according to CCC. The conventional wisdom is that shops hate all totals. However, scenarios exist in which the ability to immediately declare a vehicle a total and get rid of it can be profitable for a repairer. The shop can collect whatever charges they billed (storage, for example) during the process and free up manpower for other in-progress jobs — improving cycle time and touch time — or for starting work on a new, repairable vehicle. 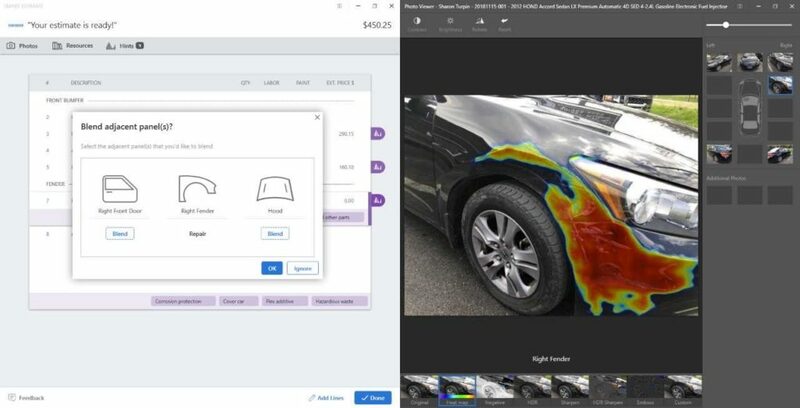 Damage Detection, which automatically highlights all vehicle damage with a heat map consumers say they like. Again, no substitute for the actual repair plan. But perhaps useful in helping demonstrate damage to an adjuster or wowing customers. Verlen said he wants to perfect the use case before extending the suite’s technology to shops. Smart Total Loss has an obvious value to an insurer, he said: They know immediately to send it to the salvage yard. “Right, game over,” he said. But, he asked, what was the value for a shop, and would an insurer agree with the assessment? “We have got to nail that down with precision,” he said. Perhaps it was a matter of talking to insurers, getting them to accept a Smart Total Loss estimate from repairers, he said. Some of the suite might with “trivial changes” be able to be sold to shops in 2019, Verlen said. Other elements might need more work, he said. There must be a business case, or else it’s just “blindly throwing technology at somebody,” he said.